What’s better than ice cream on a hot summer day? A delicious scoop of gelato. Creamier and richer in texture, gelato is Italian ice cream at its finest. It has a lower fat content than regular ice cream and contains very little cream. 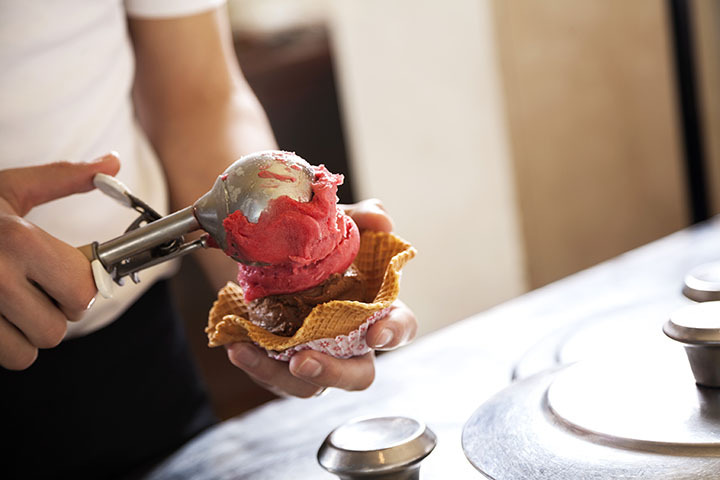 Because of the lack of fat, one is able to better taste the natural flavoring of the gelato. It takes your taste buds to a new level, so be sure to visit these 10 best gelato places in Indiana today! Jeanne’s Gelato & More is considered a hidden gem in southern Evansville, Indiana. The customer service is outstanding, and the gelato even better. With over 200 flavors to choose from and new flavors being created daily, Jeanne’s is a one of a kind gelato tasting experience. For something a little different, try the honey lavender gelato or for all the pumpkin lovers out there, a pumpkin pie flavored gelato! You won’t be disappointed! The Muddy Monkey in western Richmond, Indiana is the place to be for the best gelato. They are independently and locally owned and operated. The belief at Muddy Monkey is that the customers receive the best quality product and they use real ingredients to flavor the gelato and ice cream and other delicious desserts. With over 21 flavors to choose from and over 45 toppings to choose from, Muddy Monkey is the choice for Hoosiers who love their gelato. The Twisted Cow Frozen Treats in Elkhart, Indiana is a one stop shop for customized treats that will amaze your taste buds. Create your own frozen treat by choosing from their huge selection of flavors and toppings. They also offer gluten-free, no sugar added, and non-dairy options so everyone can enjoy! There are also over 90 toppings to choose and create a one of a kind treat. If you ever find yourself in Roanoke, Indiana, be sure to stop and visit Moose and Mollie’s Café and Gelato. The chalkboard behind the counter is a color and welcoming site when visitors walk in, as are the 14 incredible gelato flavors just waiting to be tasted. Everything on the menu is amazing, fresh, and worth every penny! Mamma Mia Gelato in Carmel, Indiana, has only been open for a week but already they’ve attracted so many gelato lovers across the Hoosier state with their delicious, handmade, homemade gelato. Owners Lucio Romani and Stefano Gangitano, true Italian natives, bring the authentic taste of Italy with fresh ingredients, from nut butters and infuse flowers combined with cream, milk, and sugar to achieve that smoothness that only gelato can have. If you are looking for a new gelato place this year, give them a try! Handmade. Fresh. Creamy and delicious. These are the words people use to describe Pinocchio’s Original Italian Ice Cream in Greenwood, Indiana. The ice cream and gelato are made daily on site, and your mouth waters just looking at all the flavors that are offered. Pinocchio’s is whimsical and reminiscent of the old 1950s ice cream parlors, and a feel-good place to eat enchanting Italian gelato. Who knew there was such a thing as vegan gelato? If you’ve ever wanted to try it or were curious about it, come to Mami’s Gelato shop in southern Bloomington, Indiana. Hand-crafted in house and using old family recipes, Mami’s has a variety of smooth, creamy and tasty gelato, with flavors such as pistachio, panna, and Mexican chocolate. Jill Marie’s Market in Crown Point, Indiana is unique when it comes to gelato shops in Indiana. Not only do they offer some of the most delicious, Palazzolo’s gelato, they are also a retail and gift shop. The café is quaint and offers up a delectable selection of treats and other goodies, and exceptional customer service. The Dog Days Ice Cream Parlor in northern Chesterton, Indiana has some of the best ice cream in Indiana, but they also have the best gelato as well. Though their selection is small, it is also unique, serving up flavors such as tiramisu, hazelnut, coconut and pistachio flavored gelato. Hurry in before the weather changes and try some of this delicious gelato today! Opa! If you order nothing else from this fabulous Greek restaurant in Indianapolis, you must order their amazing gelato ball! A delicious, creamy, decadent ball of vanilla and chocolate gelato that will leave you feeling like you are in heaven after one bite. The atmosphere is warm and welcoming, and you feel as though you’ve been added as a member of the family. Be sure to join in on the belly dancing fun before you leave!